Rob Kiser/AIM Media Troy’s Delaney Davis hits a shot during the Covington Lady Bucc Pink Out Monday at Echo Hills. Rob Kiser/AIM Media Miami East’s Paige Lawson lines up a putt during the Covington Lady Bucc Pink Out Monday at Echo Hills. Rob Kiser/AIM Media Bethel’s Skylar Johnson hits a chip shot during the Covington Lady Bucc Pink Out Monday at Echo Hills. Rob Kiser/AIM Media Miami East’s Kirsten Overholser putts during the Covington Lady Bucc Pink Out Monday at Echo Hills. Rob Kiser/AIM Media Covington’s Morgan Lowe hits a chip shot during the Covington Lady Bucc Pink Out Monday at Echo Hills. Rob Kiser/AIM Media Troy’s Delaney Davis follows through on a shot during the Covington Lady Bucc Pink Out Monday at Echo Hills. Rob Kiser/AIM Media Bethel’s Skylar Johnson putts during the Covington Lady Bucc Pink Out Monday at Echo Hills. Rob Kiser/AIM Media Miami East’s Paige Lawson putts during the Covington Lady Bucc Pink Out Monday at Echo Hills. Rob Kiser/AIM Media Miami East’s Kirsten Overholser follows through on a shot during the Covington Lady Bucc Pink Out Monday at Echo Hills. 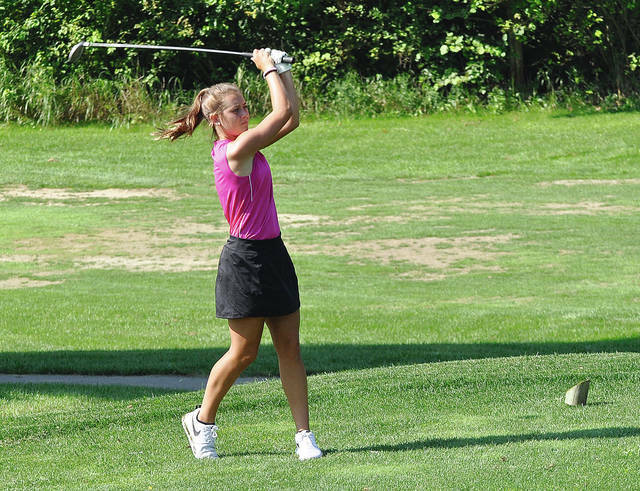 PIQUA — The girls golf season kicked off Monday as Covington hosted the Lady Bucc Pink Out at Echo Hills in Piqua. St. Henry came away with the team title with 394, while National Trail carded 396, Fort Loramie had 398 and New Bremen had 401 to round out the top four. Miami East led Miami County’s team, finishing sixth with a 405 score. Troy shot 421, Piqua was ninth with a 437 total, Bethel shot 482 and Covington was 14th with a 521 total. National Trail’s Makenna Jones was medalist with a 74. Miami East was led by Paige Lawson with a 90. Kearsten Kirby added a 94 for the Vikings, Marissa Kearns shot 107, Maci Krites shot 114, Kirsten Overholser shot 117 and Cadence Gross shot 132. 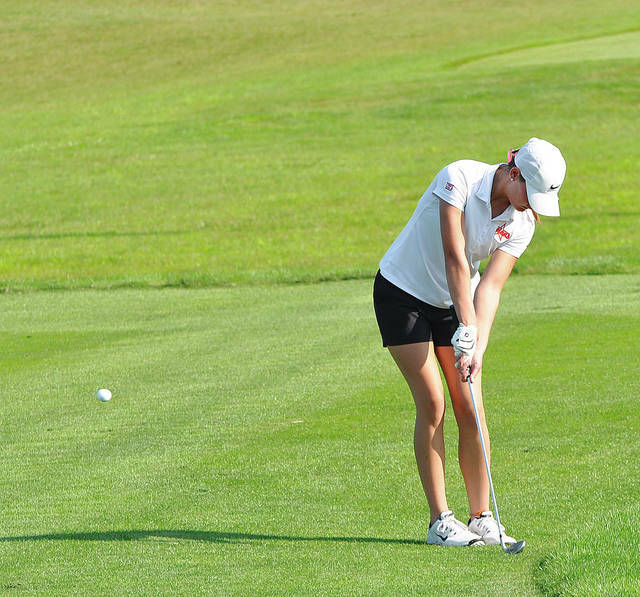 Paige Stuchell led the Trojans with a 98, the only Troy player to break the 100 mark. Camryn Spencer shot a 100 for Troy, Riley Johnson shot 110, Lauren Garlow shot 113, Delaney Davis shot 125 and Libby Harnish shot 138. Kelsey Bachman led Piqua with a 90. Other Piqua scores were Skylar Sloan 112, Caitlyn Robertson 117, Hannah Anderson 118 and Addie Honeycutt 128. For Bethel, McKenna Gray led the way with a 106. Ashley Newton added a 121 for the Bees, Evelyn Barber shot 123, Maddie Sherck shot 132 and Skylar Johnson shot 134. Sarah Slusher led Covington with a 125. Other Covington scores were Morgan Lowe 127, Katie Hembree 131, Emily Thompson 138 and Emily Hedrick 144. MIAMISBURG — Even though it dropped three places in the overall standings compared to the previous day, the Troy boys golf team showed improvement at Tuesday’s Miamisburg Invitational, shooting 11 strokes better as a team with a 335 to take fifth. The Trojans came in as the defending tournament champions from last season, having shot a 346 and finished second at the season-opening Urbana Invitational on Monday. But Brookville won Tuesday’s tournament with a 322, Carroll was second at 323, Springboro’s ‘B’ team was third with 325 and Northmont was fourth with 331. Scribner, a senior, led the Trojans with a one-under 71, tying for second individually and missing medalist by only one stroke. Ryan Dowling added an 83 for the Trojans, Zac Collin shot 90, Nathan Henderson shot 91, Travis Bertram shot 92 and Henry Johnston shot 94. “Ryan played really well today, and Zac continues to be very consistent,” Evilsizor said. “Right now our seniors’ scores are a little bit too high, and they know that. Today they struggled and could’t break 90, and if we had a couple of them break 90 today, we could have maybe sneaked up to third or fourth. And I was happy with Henry Johnston who, as a freshman in his first varsity match, played 18 holes and was two strokes away from us counting his score. He hung in there pretty well. 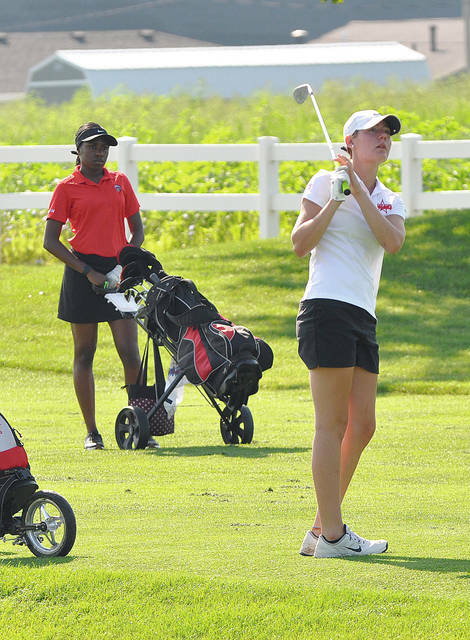 Tippecanoe was right behind the Trojans, finishing sixth with a team score of 339. Braydon Bottles led the Red Devils with an 80, Matt Salmon shot 82, Nathan Gagnon shot 86, Nolan Mader and Austin Post both shot 91 and Joey Pleiman shot 103. Tippecanoe travels to Xenia Wednesday, while Troy plays in the Greenville Invitational Thursday. DAYTON — The Milton-Union boys golf team opened its season Tuesday by traveling to Northridge, picking up a Southwestern Buckeye League Buckeye Division victory, 190-267. Justin Brown was medalist for the Bulldogs (1-0) with a 44, Max Grafflin shot 47, Nick Brumbaugh shot 48 and Josh Strader shot 51. Milton-Union will compete in the Kendig Memorial tournament Wednesday at Echo Hills. NEW BREMEN — The Lehman boys golf team placed 10th at New Bremen’s Cardinal Invitational Tuesday, shooting a 401 as a team. Mike Rossman led the Cavaliers with a 93, Cole Gilardi and Alex Keller both shot 96, Brandyn Sever shot 116, Reid Thomas shot 132 and John Gagnet shot 135.
https://www.tdn-net.com/wp-content/uploads/sites/21/2018/08/web1_080618rk_troy_delaneydavis-1.jpgRob Kiser/AIM Media Troy’s Delaney Davis hits a shot during the Covington Lady Bucc Pink Out Monday at Echo Hills. https://www.tdn-net.com/wp-content/uploads/sites/21/2018/08/web1_080618rk_me_paigelawson-1.jpgRob Kiser/AIM Media Miami East’s Paige Lawson lines up a putt during the Covington Lady Bucc Pink Out Monday at Echo Hills. https://www.tdn-net.com/wp-content/uploads/sites/21/2018/08/web1_080618rk_troy_rileyjohnson2-1.jpgRob Kiser/AIM Media Bethel’s Skylar Johnson hits a chip shot during the Covington Lady Bucc Pink Out Monday at Echo Hills. https://www.tdn-net.com/wp-content/uploads/sites/21/2018/08/web1_080618rk_me_kirstenolverholser-1.jpgRob Kiser/AIM Media Miami East’s Kirsten Overholser putts during the Covington Lady Bucc Pink Out Monday at Echo Hills. https://www.tdn-net.com/wp-content/uploads/sites/21/2018/08/web1_080618rk_cov_morganlowe-1.jpgRob Kiser/AIM Media Covington’s Morgan Lowe hits a chip shot during the Covington Lady Bucc Pink Out Monday at Echo Hills. https://www.tdn-net.com/wp-content/uploads/sites/21/2018/08/web1_080618rk_troy_delaneydavis2-1.jpgRob Kiser/AIM Media Troy’s Delaney Davis follows through on a shot during the Covington Lady Bucc Pink Out Monday at Echo Hills. https://www.tdn-net.com/wp-content/uploads/sites/21/2018/08/web1_080618rk_troy_rileyjohnson-1.jpgRob Kiser/AIM Media Bethel’s Skylar Johnson putts during the Covington Lady Bucc Pink Out Monday at Echo Hills. https://www.tdn-net.com/wp-content/uploads/sites/21/2018/08/web1_080618rk_me_paigelawson2-1.jpgRob Kiser/AIM Media Miami East’s Paige Lawson putts during the Covington Lady Bucc Pink Out Monday at Echo Hills. https://www.tdn-net.com/wp-content/uploads/sites/21/2018/08/web1_080618rk_me_kirstenoverholser3-1.jpgRob Kiser/AIM Media Miami East’s Kirsten Overholser follows through on a shot during the Covington Lady Bucc Pink Out Monday at Echo Hills. https://www.tdn-net.com/wp-content/uploads/sites/21/2018/08/web1_080618rk_me_kirstenoverholser2-1.jpgRob Kiser/AIM Media Miami East’s Kirsten Overholser putts during the Covington Lady Bucc Pink Out Monday at Echo Hills.